(CNN) -- Italian giants Juventus have completed the signing of Brazil playmaker Diego from German Bundesliga club Werder Bremen in a $34 million deal. Brazil playmaker Diego, right, has completed his $34 million move to Juventus from Werder Bremen. The 24-year-old, who missed the recent UEFA Cup final defeat against Shakhtar Donetsk because of suspension, has penned a five-year contract with the Serie A giants. "I am enthusiastic and delighted to be a part of such a prestigious club," said Diego, whose contract at Werder Bremen was due to run until June 2011. "I have dreamed of this moment since I was a child. 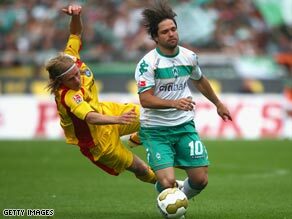 Diego joined three seasons ago from Porto and his Werder farewell will be in the German Cup final against Bayer Leverkusen at the weekend. "After an experience in Portugal and in the Bundesliga, I will be able to prove my worth at a high level but difficult competition," he added. "It is the right time for me to take this important step and I am convinced that at Juventus I will be able to achieve great results." Last week, Juventus announced that Italy captain Fabio Cannavaro is rejoining them after three years at Real Madrid. News of Cannavaro's return came less than 24 hours after the club sacked coach Claudio Ranieri and replaced him with former player and youth coach Ciro Ferrara. Ferrara's appointment had an immediate impact and Juventus are now level on points with AC Milan in second position after a 3-0 weekend victory at Siena. It was their first win in eight matches and guaranteed them Champions League action next season. The 35-year-old Cannavaro was voted world player of the year after leading Italy to World Cup glory in 2006 and has helped Real to achieve two title triumphs during his stay in Spain.